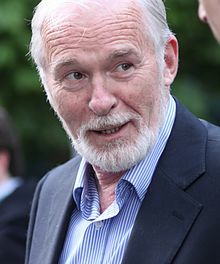 Ian McElhinney (born 19 August 1948) is a Northern Irish actor and director. He has appeared in many television series. He is known for his role as Barristan Selmy in Game of Thrones, and as General Dodonna in Rogue One. ↑ Walker, Tim (7 August 2014). "Game of Thrones star's ghosted tweets". The Daily Telegraph. Retrieved 24 April 2015. This page was last changed on 9 July 2018, at 19:05.